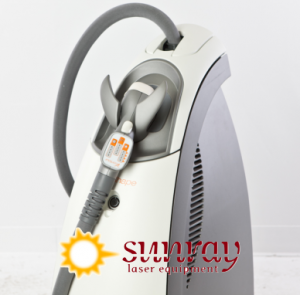 The Syneron VelaShape system is one of the most versatile and affordable cosmetic machines on the market today, and you can buy a quality refurbished Syneron VelaShape machine from SunRayLaser.com for the lowest cost. This machine provides a combination of RF, infrared light and vacuum technology to effectively target cellulite and reduce the circumference of a patient’s thigh area. It can also be used to relieve muscle pain and improve blood circulation. To get the lowest price on a used Syneron VelaShape system, simply fill out the contact form below for a no obligation price quote. The Syneron VelaShape, which is sometimes called the Syneron VelaSmooth, offers many of the same features as the newer Syneron VelaShape II but it is available at just a fraction of the price. SunrayLaser.com has the Syneron VelaShape for sale at up to 60% off the original retail cost, and we back it up with a 100% satisfaction guarantee.